New houses are often built with a half bath on the lower level. This is great when you have company as friends do not have to run upstairs through your bedroom to use the restroom, and when you are in the kitchen cooking a large meal, you can step out for a quick second when nature calls. But what about when you have a house full of overnight guests and everyone needs to get ready at once? The half bath suddenly turns into a hindrance because there is no storage or counter space to lay toiletries. If you are looking to create extra space in your half bath, here are a couple features that will help. More than likely, you have a pedestal sink in the bathroom. Pedestal sinks are great for making it feel like a larger, more open space. However, although this may look nice it does not allow for usable space. Where do you put the extra hand towels or rolls of toilet paper? And where is great Aunt Mildred going to put her curlers? 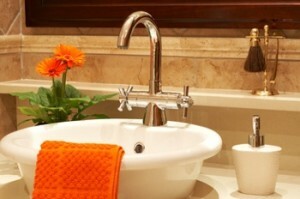 If you like the feel of the openness, you can opt for a large wall mounted sink with a vanity countertop. This will keep the open space underneath, but allow more vanity space to set items on top. You’ll be surprised how much you end up using this added space from now on. Cabinets in a small half bath sometimes get a bad rap. But the truth is, you cannot go wrong with storage space. There are so many cabinet designs and styles out there now to add a pop of flair to your space. They are made with beautiful craftsmanship and great detail, much like a piece of furniture. If the idea of adding a cabinet under the sink still does not appeal to you, opt for built in cabinets or shelves above the toilet. Take advantage of the surrounding wall space. Another idea is to replace your basic mirror with a recessed mirrored cabinet. This will add hidden storage for convenience without taking up much space. One more common challenge of the tiny-half baths is the door. Often, the door swings into the bathroom which can be a pain. Try opting for a door that swings outward when opened. This will make you and your guests feel less cramped when entering and exiting the room. Another option for door convenience is to add a pocket door. Pocket doors conveniently slide right into the wall and out of the way, so you’ll never have to worry about which way the door swings. If you’re feeling limited with your small bathroom space, there are many solutions. Don’t hesitate to ask your local kitchen and bath designers if you really get stumped with your situation, as they deal with these types of designs every day. Let them help you create a space that gives you as much functionality as possible, and you’ll be satisfied with your space.